This honing compound is very effective. It is a blend of both chromium and aluminum oxide to give the best combination of cutting speed and fine finish. The bonding is formulated for ease of charging. It will adhere equally well to felt, leather or wood. Cuts quickly but leaves a mirror finish with a light wax film. The average size of scratch pattern it leaves behind is 0.5 microns or 0.0005 mm. Ideal for carving tools and firmer gouges, it can be used for final honing of almost any tool. 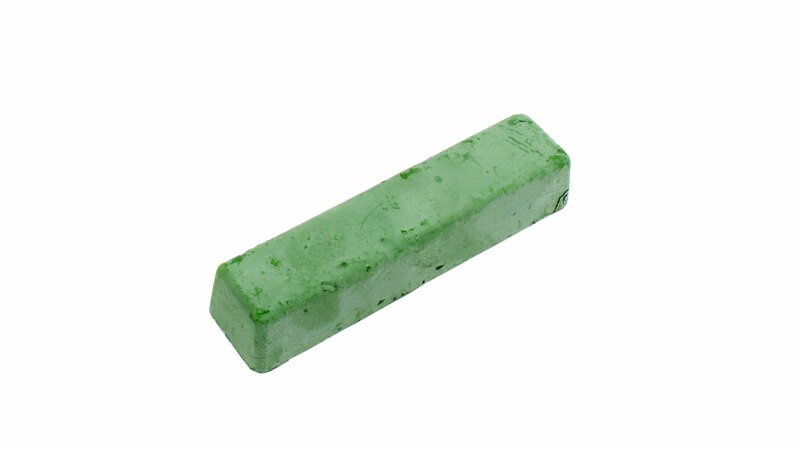 Used with a felt wheel or leather belt for power honing or with a leather strop for hand honing. Available in bars 120 x 25 x 25 mm. Weight 170 g.
Plane irons and chisels are far easier to sharpen than gouges, just because a honing surface that fits the shape of the cutting edge (flat!) is easier to come by. In-cannel gouges can be honed with a variety of cylindrical devices, such as leather-wrapped dowels, that can be made to match the edge with little difficulty. 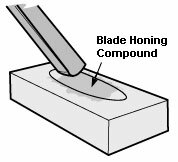 Honing the outside of a gouge means solving the problem of finding the shape to hold the compound that is precisely the shape of the cutting edge of the gouge. That shape can best be defined by using the gouge itself to form it. Choose a piece of straight-grained, knot-free wood, the softer the better. Cut a channel into it, using the gouge that is to be honed. Cut it deep enough that the entire cutting edge is below the surface of the wood. The cross-section of the channel should be the precise shape of the gouge seen edge-on. 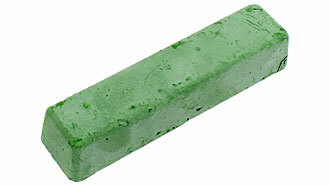 Then rub a generous coat of VERITAS Blade Honing Compound into the surface of the channel. Pressing the gouge into the channel so that the outer surface at and behind the edge bears firmly on the wood, drag it backward along the channel a number of times, until the edge takes on a mirror sheen. If the inner surface has been given a proper honing, you will have a razor-edged gouge, ready to use.